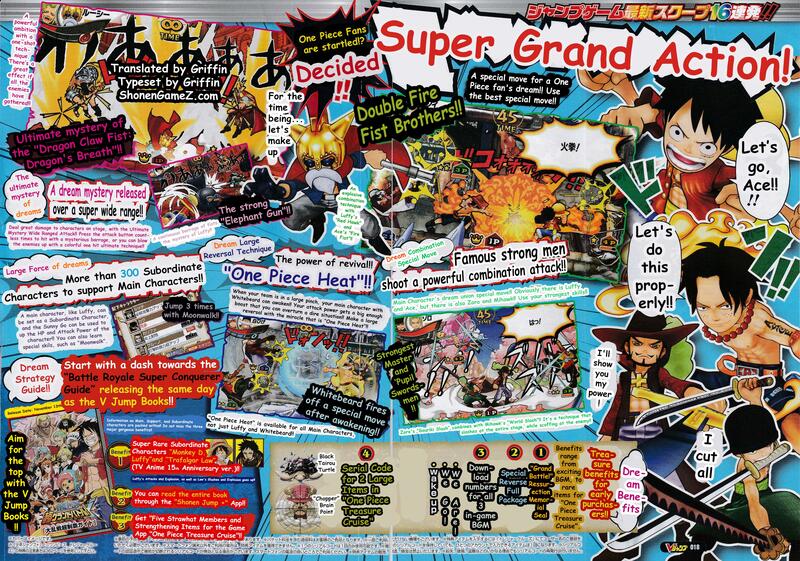 One Piece: Super Grand Battle! X V-Jump scans have finally been translated and there’s a couple of new things in the three page special. 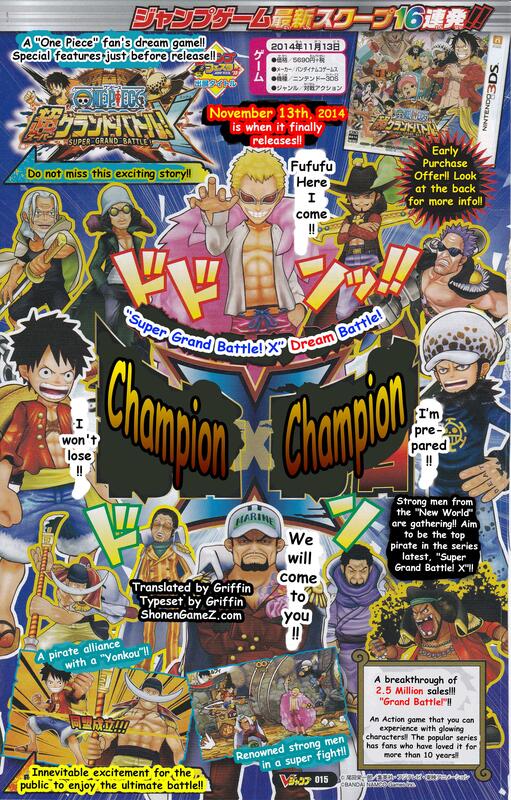 Finally, if you purchase the special game guide you’ll get Luffy and Law with their 15th Anniversary clothing as two “super rare” subordinate characters. I disagree. These guys have a pretty good track record. They made the DS games which were ok and also made Jump Super and Ultimate Stars. And it looks a lot like Jump Super and Ultimate Stars so I’m pretty sure this game is gonna be awesome. Is this game just going to be released in Japan? I’m sure it will be localized sometime next year. Can you check, theres one Scan missing I think there was 2 the first time I open this News and now there are only one. There’s two scans. Technically a total of three but we combined it to make it one big scan. Don’t have that scan for some reason. I’ll wait for Pirate Warriors 3 to be released in US. 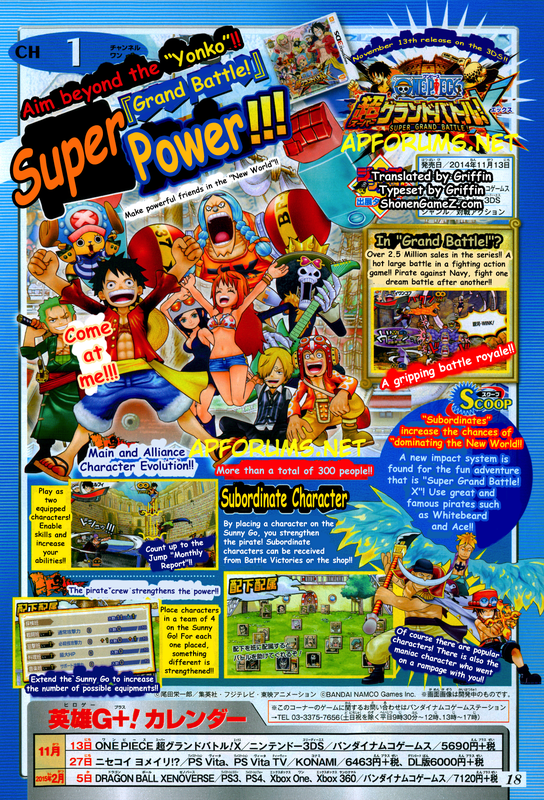 Wonder if the US will ever get a Eng dub one piece game. Still waiting for enel, moriah (was shown in a scan), and Hody to be announced. Enel is in Game but I hope playable. Praying for a localized release!